232. The Things I’ll Do for a Snack. What does a Girl do when it’s 4:15, she’s starving, doesn’t has a snack and has nearly two hours before she walks through her front door? She dives deep into the bowels of her work fridge in hopes of finding a left behind snack. I was excited to discover this Strawberry Banana Chobani. 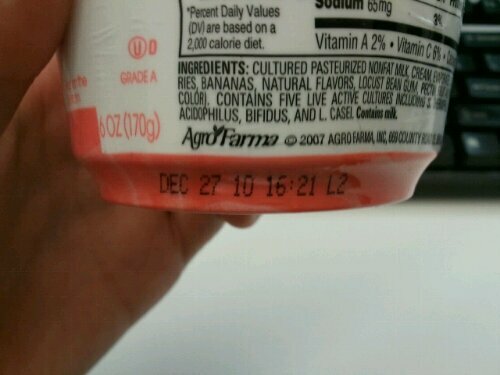 I was less excited to discover the date on said Stawberry Banana Chobani. Myself: Month old Chobani huh? Are you really thinking about eating that? Me: Well, it could still be good. Let’s see. Myself: Maybe you should smell it. Myself: Try stirring it up. Me: Well, it is a little thicker than usual. Myself: Are you really going to taste that? PS. I’ll let you know if I regret my decision to eat a month old Chobani in a few days. bwahaha. I did the same thing the other day. ate an expired yogurt, but that was AFTER i didn’t get sick eating the yogurt i bought on Saturday evening, put in the house on the floor (which is sorta cold due to it being eyeball freezing outside), then went to the neighbors, had a big glass of wine, came home and forgot the yogurt til the next day. OOPS! But they were the kind that are normally more than a buck, on sale for 89 cents each, date & fig greek yogurt from Whole Foods. I gave it a whirl and didn’t get sick. I figure the beneficial bacteria had multiplied during their evening on my floor in a WF bag. Hahaha! That’s very brave of you. I’m usually pretty conscious of food safety, but I was way too hungry to care! Although if it had smelled funny or tasted weird, I wouldn’t have eaten it.